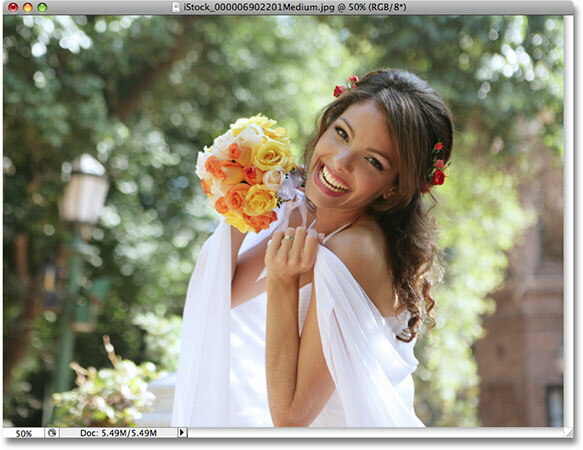 Cropping images is by far one of the most common, every day uses for Photoshop. It's so common that Photoshop comes with a tool designed specifically for cropping photos, conveniently named the Crop Tool. One of the great things about the Crop Tool is that you can easily crop your photos to common photo sizes like 4x6, 5x7 or 8x10 simply by entering the width and height values into the Options Bar before dragging out your cropping border, or by selecting a preset crop size from the Preset picker. That may be great, but what if you don't want to change the aspect ratio of the photo? What if you want to crop the image while keeping the width-to-height ratio the same as the original? And what if you're not sure what the original aspect ratio actually is? You could open the Image Size dialog box to find out the width and height of the image and then do the math, but there's an even easier way thanks to a rarely used but very useful command in Photoshop called Transform Selection, which is what we're going to be looking at in this tutorial. A selection outline appears around the entire photo in the document window. As its name implies, Photoshop's Transform Selection command allows us to make changes to the selection outline itself without affecting anything inside of the selection. In this case, we want to resize the selection outline and make it smaller until it surrounds only the part of the photo that we want to keep, allowing us to crop away everything else. To resize the selection, hold down your Shift key, then click on any of the handles (the little squares) in the corners of the selection and drag the corner inward. Holding the Shift key down forces the width-to-height aspect ratio of the selection to remain the same as you drag, which is what allows us to maintain the same aspect ratio as the original photo. Hold Shift and drag any of the corner handles inward to resize the selection outline while keeping the aspect ratio the same. When you're done, press Enter (Win) / Return (Mac) to accept the transformation. The aspect ratio of the cropped image remains the same as the original photo. To remove the selection outline, either go back up to the Select menu and choose Deselect or use the keyboard shortcut Ctrl+D (Win) / Command+D (Mac). And there we have it! That's how to crop photos without changing the original aspect ratio in Photoshop! Check out our Photo Retouching section for more Photoshop image editing tutorials!